The spinal cord is a tubular bundle of nervous tissue that occupies the superior two-thirds of the vertebral canal. It is continuous with the medulla oblongata, and narrows to terminate at the conus medullaris. The conus medullaris is the cone shaped distal end of the spinal cord, anchored to the coccyx by a meningeal fibrous strand termed the filum terminale. In a human adult, the spinal cord extends from the foramen magnum to the level of the junction between the first and second lumbar vertebrae (L1-L2). The main function of the spinal cord is the innervation of the trunk and limbs through the spinal nerves and their peripheral ramifications. It receives afferent fibers from the peripheral receptors present in somatic and visceral structures, and sends motor axons to the skeletal muscle. Moreover, it contains cell bodies of the preganglionic neurons responsible for the sympathetic innervation of the smooth cardiac muscles and secretory glands, and for the parasympathetic innervation of the smooth muscles present in the distal part of the hindgut, the pelvic viscera, and the erectile tissue of the external genitalia. The spinal cord is linked with the brain by an abundant number of ascending and descending pathways formed by white matter. This allows the higher centers to monitor and perceive both external and internal stimuli, and to regulate and control the spinal efferent activity. The spinal cord does not have a unified diameter along its length. It has two prominent swellings that are associated with the origin of the spinal nerves that innervate the upper and lower limbs. The cervical enlargement innervates the upper limbs, and occurs in the region associated with the origins of the spinal nerves of the fifth cervical vertebra till the first thoracic vertebra (C5-T1). The lumbosacral enlargement on the other hand, innervates the lower limb. It occurs in the region associated with the origins of the spinal nerves of the first lumbar vertebra till the third sacral vertebra (L1-S3). The spinal cord is enclosed by three layers of protective tissue termed the spinal meninges. 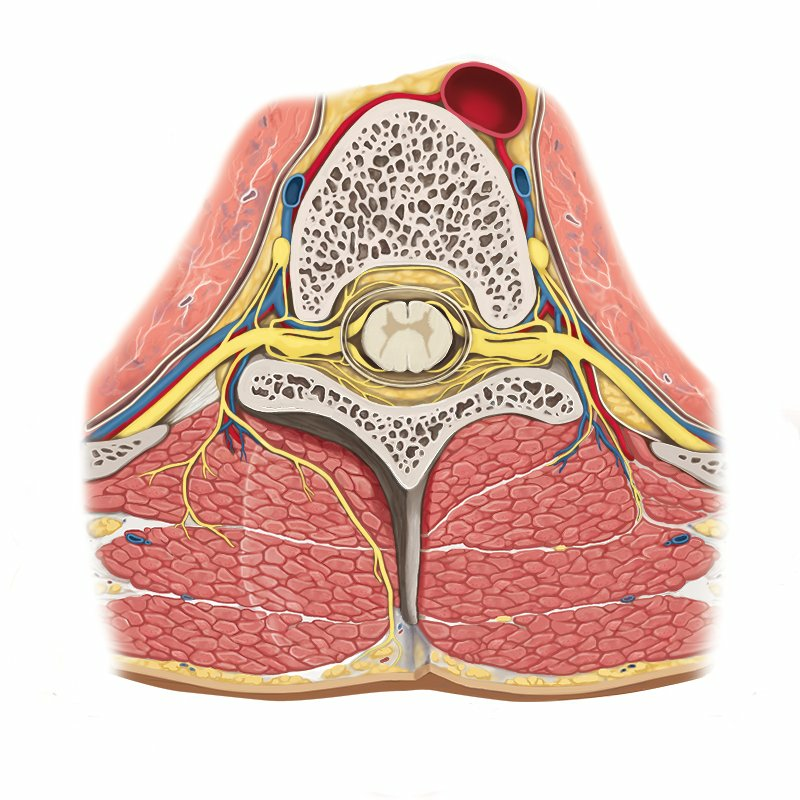 These three layers are the dense outer dura mater, the delicate middle arachnoid mater, and the innermost pia mater. The cerebrospinal fluid contained within these layers is responsible for the support, nourishment, and protection of the spinal cord. Thirty-one bilaterally paired spinal nerves arise from the spinal cord to form the peripheral nervous system. They are attached to the spinal cord as a series of smaller posterior (sensory) and anterior (motor) nerve rootlets. The posterior rootlets contain afferent nerve fibers, while the anterior rootlets contain efferent nerve fibers. Adjacent rootlets join to form posterior or anterior nerve roots that cross the subarachnoid space and unite to form functionally mixed spinal nerves. Each of the spinal nerves leaves the vertebral canal through the intervertebral foramina to divide into posterior and anterior rami. The posterior rami supply the intrinsic back muscles and the overlying skin, while the anterior rami supply most of the remaining areas of the body, except for certain regions in the head. All major plexuses (cervical, brachial, lumbar, and sacral) are formed by the anterior rami. Near the point of division into posterior and anterior rami, each spinal nerve gives off two to four recurrent meningeal branches that re-enter the intervertebral foramina to supply the dura, ligaments, intervertebral discs, and blood vessels. Want to learn more about the Spinal cord? Spinal cord in situ seen at the level of a thoracic vertebra. Full structure of the spinal cord seen from a dorsal view. Arteries and veins of the spinal cord.